The issue of financial market volatility has become increasingly important in recent times. Concern has been focused upon whether volatility has risen, whether deregulation and innovation alter the amount of systemic volatility or redistribute it, whether global financial integration leads to faster transmission of volatility across frontiers, how financial managers can most efficiently manage risk and what role regulators ought to play. The analysis presented here first overviews developments in the measurement of volatility. In doing so, it employed a comprehensive dataset of economic and financial variables for 6 countries (Britain, France, Germany, Italy, Japan and the US) over the period January 1973–December 1994 to illustrate the traditional and recently developed measures of volatility. A by-product of this includes an assessment of the relative volatilities of the economic and financial systems of the countries included in the sample. 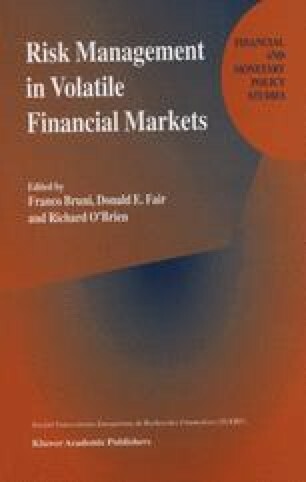 The analysis then focuses on the international transmission of financial volatility by presenting the results of a vector autoregressive model which describes the international transmission of stock market volatility. The analysis finally examines three current issues which are faced by regulators and policymakers who are concerned about financial volatility and its transmission. First, does portfolio insurance cause financial volatility, second, can circuit breakers, margin requirements and price halts lead to a sustainable reduction in volatility and third, should inter-market clearing and credit mechanisms be improved and should one regulator oversee the various markets? The prevailing view seems to be that the answer to the first two questions is negative and to the final question is positive. Overall, the conclusion is reached that more international collaboration in managing financial volatility in markets other than the foreign exchange market should be on the European agenda.